Anything wine can do, beer can do better. Yep, I went there. Picking favorites? Probably. As someone who loves cooking with (and drinking) beer, adding it to risotto was one of those “no duh, why haven’t I been doing this all along?” cooking moments. 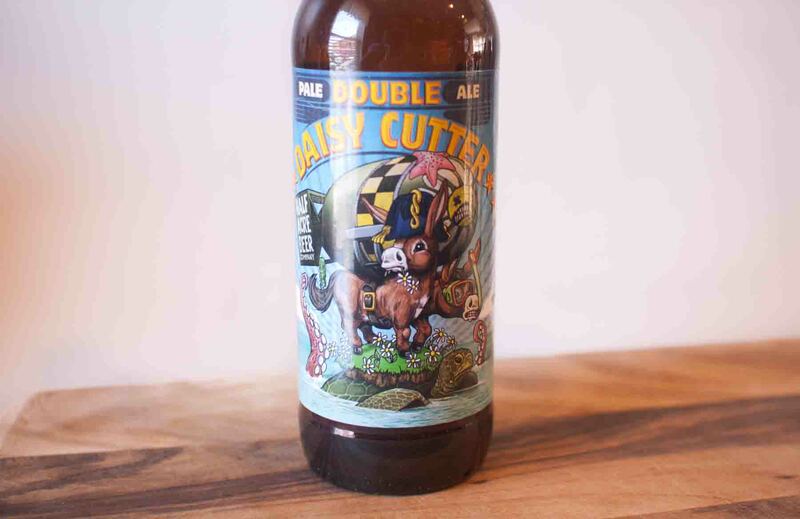 I chose a double IPA (local favorite Half Acre Beer’s Double Daisy Cutter, to be exact) for this recipe — not only because it’s my favorite style of beer, but because I wanted to instill as much hop flavor in the final dish as possible. The hops work really well here and stand up perfectly to the spicy sausage and mushrooms. Sorry wine, you’ve been replaced. In a small saucepan, heat chicken stock over low heat. In a separate large saucepan, melt two tablespoons of butter over medium-high heat. Add sausage and cook until no longer pink, breaking apart with a spatula as you go. Add onion and mushrooms and cook until onion is translucent; about five minutes. Add the rice and stir to combine. Add a half cup of double IPA, bring to a boil and cook, stirring occasionally, until most of the liquid has absorbed. Repeat with the other half cup. Add warm chicken stock in half cup increments, stirring constantly until absorbed, until all stock has been added; approximately 15 minutes. By the time all the stock has been added, the risotto should look creamy and the rice should be fully cooked. If the rice still has a bit of bite, add a bit more chicken stock and cook until it’s completely done. Remove risotto from heat. Add remaining tablespoon of butter, parmesan cheese and parsley; stir to combine. Top each portion with additional cheese. Beer in Risotto? Yes. My brother claims to have “perfected” a risotto recipe, but I’d bet his college rugby friends would go for THIS version every day of the week, hands down. Holy wow! Who would’ve thunk it! You’ve got my wheels turning now, Bobbi! What a cute bottle of beer. I’ve never tried that one. And from one beer aficionado to the other, I agree that cooking with beer almost always trumps cooking with wine. A lot of Peruvian food calls for beer and just the smell of it braising away with chicken, beef, whatevs, is enough to make this lady sing. It is cute, right? A friend of mine designs all the labels for that brewery — he always does great stuff. That label is amazing. My hub and I talk about how fun it would be to design different labels. He actually is a graphic designer. I am not. I would be the taster and inspiration giver. …Obviously we haven’t worked out all the details yet. 😉 I need to check out Chicago beers! And add it to risotto. 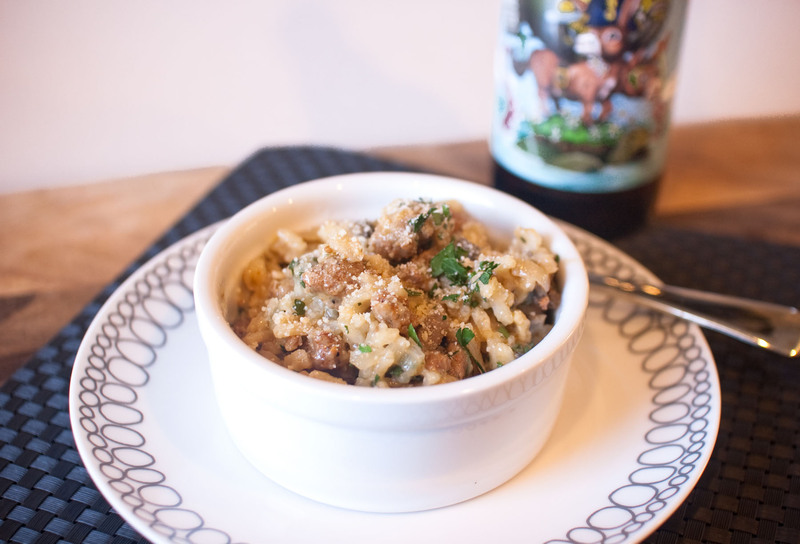 Love the idea of beer in risotto! Can’t wait to give it a whirl. oooh thems is fightin’ words my friend 😉 beer is good. but i’m not so sure i’ll let it replace wine permanently. Mmmm… beer and risotto!! Sounds like a great marriage to me! I had a risotto and beer dish last time I was in Italy and it was incredible! I can’t wait to try this recipe out at home! Amazing! I hope it brings back some Italy vibes for you.